In an effort to promote excellence, two Lagos State legislators on Monday rewarded two nurses at the Isolo General Hospital, Lagos, with N200,000 for outstanding service. Messrs Segun Olulade and Jude Idimogu honoured Mrs Adefolakemi Oladimeji and Mrs Olufunmilayo Oyekunle following praises by patients. Olulade, the Chairman of the Lagos Assembly Committee on Health Services, and Idimogu, a member of the committee, jointly gave the reward during the committee’s visit to the hospital. The visit was part of the Assembly’s oversight function. Many patients in the ante natal section of the hospital had expressed satisfaction at the services of the two nurses, who they described as tolerant and caring. According to them, in spite of the large number of the expectant mothers, the nurses do their work cheerfully. Mrs Amaka Onyekwele and Mrs Veronica Ekong, who spoke separately on behalf of more than 100 patients in the section, said that the two nurses were exceptional. The pregnant woman, however, urged the government to employ more nurses and doctors to reduce workload on those in the hospital. “I sat for hours before I was attended to because only one doctor was available for more than 50 persons. “I was given a query in my office last week because I returned late from ante-natal care; we need more personnel,” she said. Also, Ekong described the two nurses as receptive, calm and listening, adding that they were not rude and harsh as many other nurses. Responding, Olulade said: “I am impressed by this commendation of these two nurses by about 100 pregnant women. This is what we want. “These two are the true face of the state government. This kind of attitude is what we preach all over our public health facilities. “ Patients require love and not abuses,’’ he said. The lawmaker urged health workers to be caring and tolerant and avoid rude to patients. Olulade said that he would send commendation letters to the two nurses for their outstanding service. NAN reports that the committee members, who visited sections of the hospital, inquired from patients their challenges and how they could be served better. Prominent among the complaints of the patients are inadequate personnel, unavailability of drugs in the hospital and payment for items expected to be received free. Responding on behalf of the two nurses, Oladimeji said that they were elated by the gift and would continue to be of good conduct. 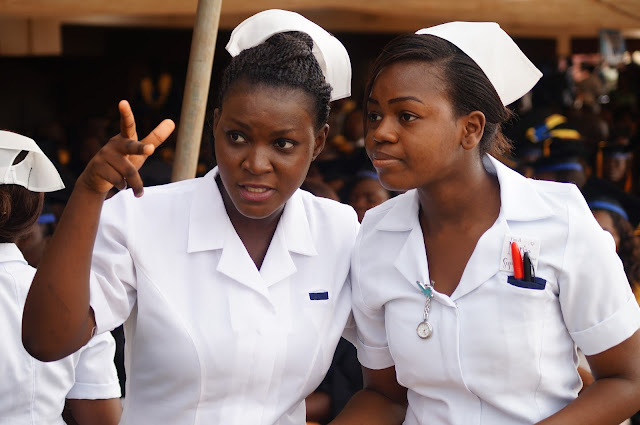 The News Agency of Nigeria (NAN) reports that the committee had during a tour of the Ajeromi General Hospital on Feb. 15, warned nurses in the hospital against rudeness as complained by patients. Olulade called on the management of the hospital to ensure that patients were treated with love and care. “Anyone that puts up any attitude that does not promote care will be investigated, and I can assure you that such a person, if guilty, will be sanctioned. “Rudeness is not acceptable in a public health facility. Patients are to be treated with love and must be treated as queens and kings,’’ Olulade had said. Also, during a tour of the Apapa General Hospital on Feb. 21, the committee frowned at negligence of duty and rudeness by some health workers, urging them to desist from unprofessional practices.